Kage Baker became fascinated with other worlds rather late in life. Real worlds, anyway; she was a devotee of imaginary worlds from an early age. Whole, entire, breathing worlds – that was what she liked. Oz, Narnia, the Summer Lands; Erl and Gormanghast. The worlds of science fiction didn’t interest her that much, because they were not matchable to their real counterparts. It was permissible, Kage felt, to outline the geography of Faerieland or Hell, because you were giving definition to a construction of gauze and fantasy to begin with. But if you were talking about what Venus and Mars and the moons of Jupiter looked like, you needed to reference the real things. Anything less was cheating. Of course, for most of the history of the genre, it wasn’t possible to match up the geography of alien worlds with the imaginings of poets: no one knew what the geography was. Even the two closest bodies – Mars and our own moon – where kept shrouded in mystery for decades by the limitations of lens quality. The shadows and bright plains of the Moon we now know to be lava flows, ejecta from meteors, or the silky dust of 5 billion year old rocks decaying under impacts and the solar wind. But early astronomers initially described vast seas and thickly wooded plateaus, confused by the thick ripples of our own atmosphere and the crude glass of their telescopes. Mars was endowed with canals, locks and channels, towering cities – all by virtue of a mistranslation from Italian, and one amateur’s short sightedness through a home-made lens. Small wonder Kage disdained the worlds of science fiction. As soon as real pictures began to arrive though – she was caught. One of the greatest thrills of her life was to sit at her computer and look at the actual, living surfaces of other worlds. Mars immediately fascinated her – never mind the lack of tharks or dune-schooners, Kage could watch the pink whirlwinds dance across the sands for hours. Mars was real. When Saturn’s moon Titan began to come under the purview of the Cassini probe, she was thrilled. 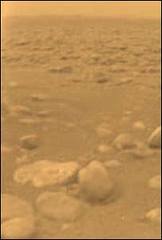 The brief visions sent back from Huygens, in its first-and-only landing on Titan, had her dancing around the living room, shouting with glee. Why? Because it landed on a tidal mudflat, and Kage could recognize it. The wet, rocky shore where it set down looked exactly like the beach two blocks from our house. Mud, rocks, puddles, the sheen of moisture and the dull matte finish of puddles: a littoral landscape, 750 million miles from Pismo Beach. Now that was the thrill of an alien world! It was real. It wasn’t fanciful, it wasn’t fantastic – but the fact that mud and rocks and tides could look the same on different worlds utterly charmed Kage. She understood completely that the rain was methane and the puddles contained ethanol, and oxygen was likely a handy metallic ice – those, she said, were just details. The miracle was that there was one best way to build a sea shore, and there it was: Real. Recognizable. A living world. “Surprising Earth-like features” it says. What that means, is: Titan is shaped like Earth. It appears there is one best way to build a world, too – at least, one that has rocks and dirt and flowing liquids. There is one best way to make sure a river system drains its lakes properly, one best way for falling liquid and blowing gasses to erode cliffs. There is one best way for ripples to form on a soft bed of mud, and it’s just as pretty when the wavelets are CH4 as when they are H2O. Kage knew that was an alien beach the moment she saw it. She’d be dancing her triumph dance again, now, if she could see this. C’mere, Harry. Time to dance!